Cheap Car Hire at Bratislava Airport - Compare SUV, Estate, MPV & Minivan rental in Bratislava. Car hire at Bratislava Airport in Slovakia, and is also bookable downtown, if prefer. Great rates with Buch Binder, Europcar, Avis, Sixt and Hertz. If arriving into Bratislava airport on business, then why not make a good impression with a vehicle from our prestige luxury line that includes the Saab 9-3 convertible automatic, BMW X3 automatic or the Audi A4 Quattro. Take note we do not charge for amendments or should you need to cancel so when comparing like for like do take this into account. With no hidden fees we advise booking today and then spend time arranging other details for your holiday or business trip. This is the obvious airport for accessto this wonderful city, but one canal so use the Schwechat airport in Vienna, which is 45 minutes away. 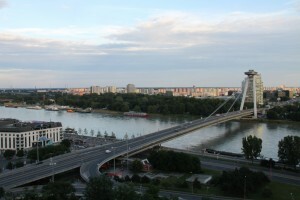 However, Bratislava Airport is only some fifteen minutes from the city centre, and if not using a rental company, then the bus service into town is good and can connect you to the train system if needed. Bratislava is another city that has the right to sing about the River Danube. It is fast becoming one of the must see weekend visit cities, although a longer stay would not go amiss. To find out why more and more tourists are catching cheap flights, and hiring a car , to this culturally rich city, visit the official Bratislava web site. If not flying into Bratislava by train, hire car or bus, then approaching the city by a Danube River Cruise is perhaps the best option. Cheaper vehicle rentals at Bratislava Airport now available here. Bratislava SUV & MPV hiring made simple. Bargain hatchback, estate and saloons in Bratislava. 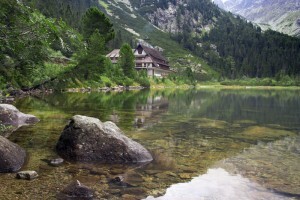 However, there is more to Slovakia than just it's capital city so we strongly suggest you drive yourself around this country, and if need some reasons why, please go to Slovakia Tourism Board for information and find out about beautiful natural parks, ski resorts and the ruins of Beckov castle, to name just some. Located on the banks of beautiful River Danube, Bratislava is the capital of Slovakia. The heart of Bratislava retains a charming medieval character exemplified by many small meandering cobble streets faced with high block housing. Experience a 360 degree view of Bratislava city, whilst having lunch, at the Veza restaurant located, within the rotating TV tower. The view is best at lunch time. We also advise phoning in advance to ensure not down for maintenance, as the rotating mechanism is very old. If not on your honeymoon, or trying to impress your partner, then try the local potent garlic soup. For shopping, visit one or more of the many mega shopping malls. A few ones of note are Polus City Center, Aupark, and Avion Shopping Palace. The Bratislava castle is rather dull, but it does offer a great view from the top - both Austria and Vienna city are visible on a clear sunny day.